A young girl exits Makati Catholic Cemetery. Boys fly kites on top of tombstones at Makati Catholic Cemetery after school. A baby sleeps on top of a tomb stone at Makati Catholic Cemetery. A family hangs out in their mausoleum in Makati Catholic Cemetery. A girl sits outside her home at Makati Catholic Cemetery. A boy peers through a gate at Makati Catholic Cemetery. A boy washes his clothing on top of a tombstone at Makati Catholic Cemetery. Stacked graves at Makati Catholic Cemetery. A teenager plays a popular gambling game in Makati Catholic Cemetery. Two boys rest in a hammock at Makati Catholic Cemetery. A baby sleeps in a hammock at Makati Catholic Cemetery. Children do their homework on top of tombstones in Makati Catholic Cemetery. A girl plays hide-and- seek in Makati Catholic Cemetery. A girl returns home to Makati Catholic cemetery after school. A child wearing grape flip-flops stands in front of a tombstone at Makati Catholic Cemetery. When the city of Manila shuts down Makati Catholic Cemetery all of the residences will be homeless and out on the street. 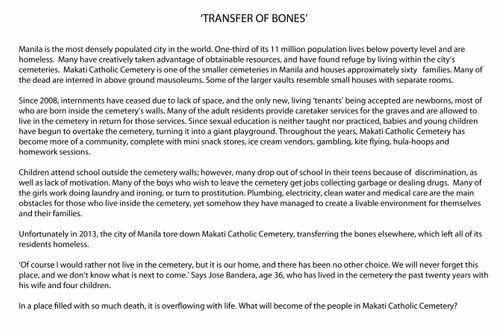 What will happen to the people of Makati Catholic Cemetery?